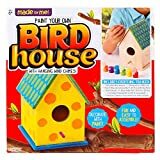 I bought a birdhouse kit that is actually a project for children, but my idea was my friend and I would assemble the birdhouses while chit-chatting over coffee. So that's exactly what we did. 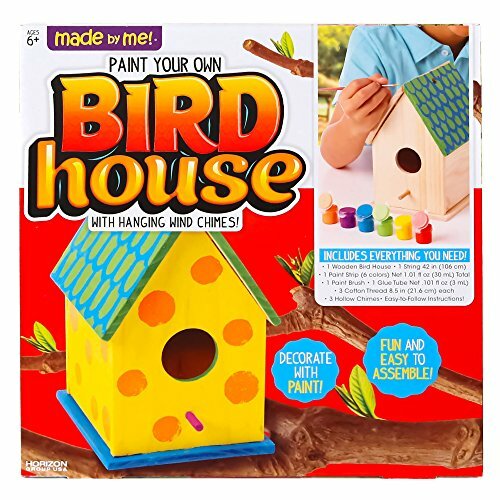 A couple of cups of coffee one morning and we each assembled and painted a birdhouse. They are very small, the one shown in the picture is 5” x 5”. I get a variety of birds in my yard all the time so I placed this tiny birdhouse in a tree expecting the smaller birds to be attracted to it. House finches are common to this area and they're small. Then one day I saw a cactus wren in the birdhouse....It's time to get a bigger birdhouse! The picture on the left is of a male House Finch, sometimes there are two of them feeding in there. The picture on the right is a female Cactus Wren (state bird of Arizona), I don't know how she got in or how she got out. The bird seed is in the tray that the birds are perched on. 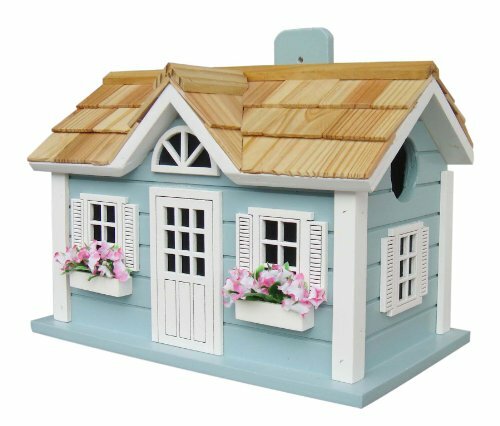 Notice how the house is not tilted with the finch, but with the wren it's tipping. This is the kit I bought for my friend and I to assemble while chit-chatting over coffee. It has a birdhouse and wind chime! 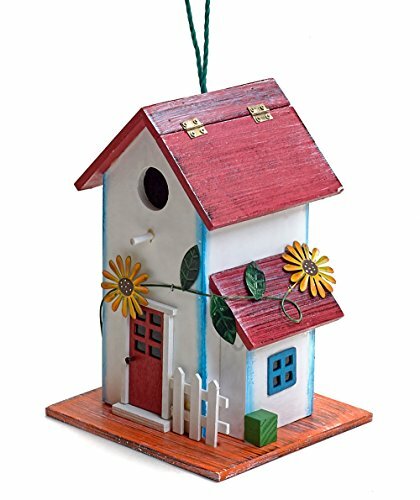 I think instead of attempting to build a bigger birdhouse I'll just buy a couple of bird feeders that will accommodate large birds. It might even attract different species that I haven't seen yet. Birds of the Desert Take a look at the birds that I see every day, I took all these pictures of birds in my backyard. The quail make me laugh because they chase each other around in circles...like the Keystone Cops. The Great Horned Owls are nocturnal and somewhat covert, so I was lucky to catch these photos, especially during the daytime. Turns out they like posing for the camera. Joshua Tree Ostrich Ranch Yes we have an ostrich ranch right here in our little town. I visited the ranch and got some good pictures. If you're ever in the neighborhood, stop in for a tour. The directions are in the article. Animals in the Yard I never know what kind of animal is going to leisurely stroll past the house or run at high speed hopping and jumping and knocking things over in their path. Hopefully I can get pictures...that's the main thing! Thanks Susan! I get flickers here too, I can just imagine one of them hanging off the side of a hummingbird feeder. Your pictures remind me of the flickers (rather large woodpeckers) who feed from our hummingbird feeders. They're way too big, but they hang off the side and have figured out how to get to the nectar! Birds are pretty crafty characters. Speaking of crafty, I love your bird feeder with wind chime craft kit. How fun! Too funny - where there is a will there is a way! I know tealmermaid! I don't know how he got in there, or out! 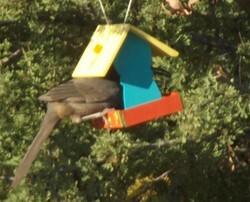 Definitely time for a bigger birdhouse! You are right on all counts mihgasper! 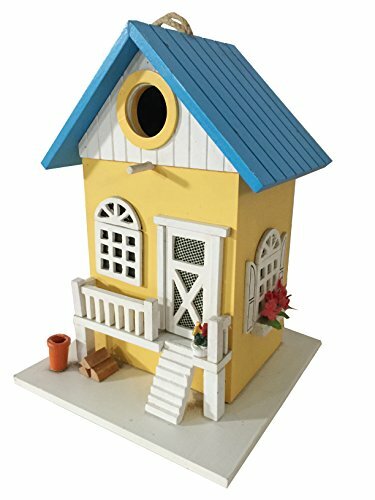 Maybe you need a whole housing complex - for bigger and smaller birds. Don't forget the rocking chair for you to enjoy watching and listening at the music events! Yes DerdriuMarriner, and busy hands don't reach for the donuts! candy47, It's always fun to be able to cross off garden and home projects over a delicious cup of coffee or tea in good company!